Hey folks Valkor here and I can't believe what slipped through the mail slot of the Val-cave. 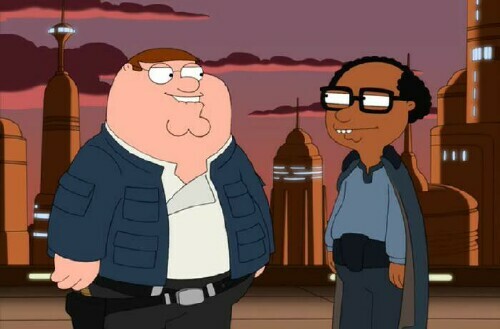 As big of a fan of Family Guy as I am, I was quite amazed to see the new Star Wars spoof entitled "Family Guy "Something, Something, Something Darkside", which is a take on the second Star Wars movie: The Empire Strikes Back, in my hands. 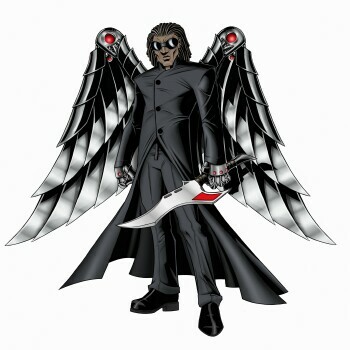 I instantly drooled, did a little dance, popped the DVD in my PS3, sat back and enjoyed the fun. It's another night at the Griffin household, with the gang settled around the tube, when suddenly the lights go out. Once again Peter is put in charge in entertaining the family. And of course they suggest he tell another Star Wars tale. 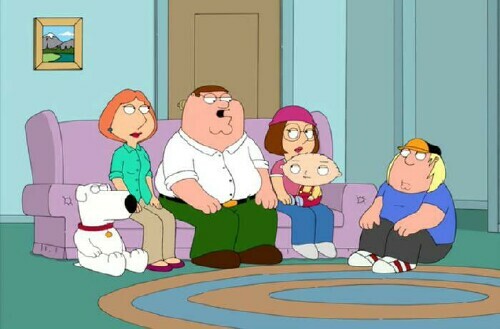 So things start off with the long scroll, which is supposed to fill in the gap of what happened previously, but this is Family Guy, so expect a few laughs in that scroll (especially the bit about Fox cancelling Family Guy twice. Man, Seth and co will never let the studio down for that one). After the scroll, we move to the Empire circling the planet Hoth, launching probes in search of the missing rebels. We switch to Luke (Chris Griffin) out on patrol, who investigates it. And… wait why am I telling you this? Everyone must know the Empire Strikes Back Story. 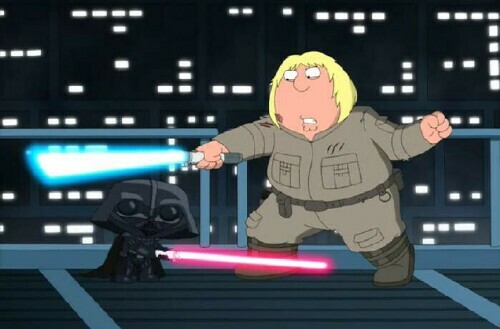 And I'm sure those that want to see this film will know what they need to know about Family Guy. Well this features follows Empire with a Family Guy spin on it. So what say we dispense with the story and get into some sweet highlights of the film, before delving into the review shall we? -	Yoda is played by Carl, Chris's boss who runs the local Quick Check, or Quick Mart. (I forget which one it is), and much like his character he wants to talk films with Luke (Chris). 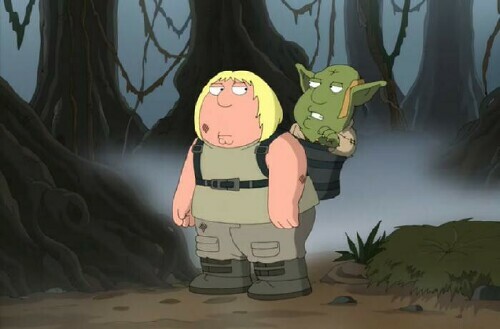 -	There's plenty of F-Bombs, one scene in particular is when Han (Peter Griffin) is about to get tossed in the carbonite. It's pretty funny. -	Lando Calrissian is played by Mort the Jew. -	Meg is seen, very briefly, as the Worm monster. 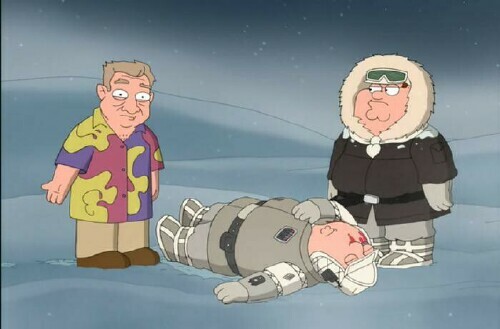 She makes a point to break the fourth wall and ask why she has no speaking role in the film, to which Han replies "Shut up Meg"
-	R2 aka Cleveland does the fall that he usually does when Peter does something to his house, and Cleveland is in the tub. "No, no, no, no, nooooooooo"
-	The Emperor is played by Carter Pewterschmidt. -	One of the best lines in the film: As Luke is fighting Vader (Stewie) he says at one point "I'd give my right hand for this day to just end." And there's plenty more jokes where that came from. So what did the Val-man ultimately think of the film? 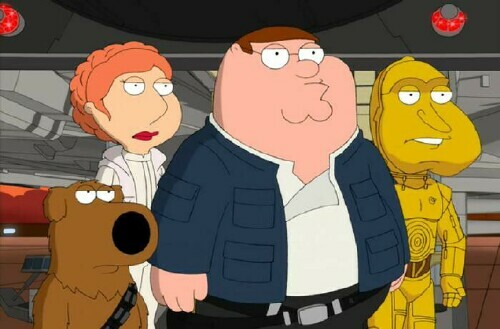 Believe it or not Blue Harvest was actually funnier (and I'll tell you why in the bad section), but this vid still has plenty of laughs to keep you interested, especially if you're a Family Guy fan, you will not be disappointed. The jokes are hit and miss, with a lot of hits, mostly sight gags. But what this film does best, and much like Blue Harvest, is it trims away the fat of the film, keeping only key points and stirring in the laughs. There's nothing more to be said, there's just too much fun to be had for one to not see this on the day it airs or pick up the DVD (or Blu ray). Some of the jokes either run too long or were just bland, where as Blue Harvest was like "BING, BING", funny joke after funny joke. Case in point: Han slices open a Tauntaun to keep Luke warm and huffs out the line "And I thought they smelled bad on the outside"… it takes him about a minute to finish that line. I also didn't care for the fact that this particular tauntaun was called a DonDon and actually had the head of Don Knotts. UGH!! One more? OK! Just before Han and Luke get rescued from the snow, Han goes off to ski with a group of peeps to the tune of the 80's Juicy Fruit commercial. Double UGH. Sure some of the jokes could have been shortened, but overall the film does what it's supposed and that's mesh to greats that go great together. 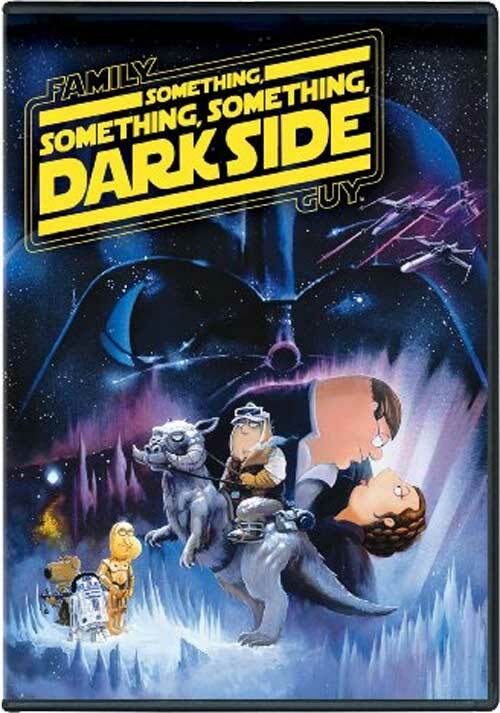 Family Guy Something, Something, Something Darkside is definitely a must see for any fan, and I assure you hilarity will ensue. So out of TOV 5 stars, I give the film a 4.5 and it's been Valkor tested and TOV Approved.